Dry, dull hair? Itchiness in scalp? Dandruff? Are you suffering from any of these problems? The reason could be your sulphate-based shampoo. But now you need not to worry! Patanjali shampoos are here to help you. 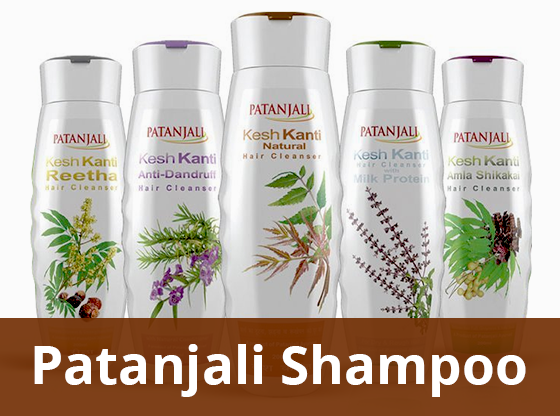 Patanjali shampoos provide nourishment to your hair and add shine and strength to them. Patanjali shampoos are manufactured by Patanjali Ayurveda Limited, an Indian consumer goods company. Patanjali Ayurveda Ltd. was established by Baba Ramdev along with Acharya Balkrishna in the year 2006. It is one of the fastest growing FMCG companies in India. It is headquartered in Haridwar and a registered office is also located in Delhi. It also has manufacturing units in Nepal as well. Now that we know a bit about Patanjali company, we would move forward and discuss the benefits that Patanjali shampoos provide to our hair. But before that, we must understand the problems our hair would face if we use sulphate-based shampoos. Sulphate is an inexpensive chemical and is generally used in products like detergents, floor cleaners, body wash and bathroom cleaners. This harsh chemical is proven to have a negative impact on our hair follicles, shaft and scalp. Dry scalp and dull hair – Sulphates drain the natural oils present in your hair & scalp and leave your scalp dry. Hair loss – Sulphates destroys your hair follicles, leading to hair loss. Itchy scalp – Sulphates increase dandruff, leaving your scalp itchy. Fades hair colour – If you are one of those who makes use of hair colour, using sulphate lightens your hair and makes them dull and faded. The natural ingredients used in Patanjali shampoos increase the growth of your hair fibre cells, provide power to the cuticles by delivering essential nutrients to them. This then results in quick growth of your hair and preventing hair loss. These ingredients also help in maintaining the quality of your hair, making them shily and silky. Patanjali shampoos also prevent early greying of your hair. That’s’ not all. Patanjali shampoo are also found to be effective for problems like eczema and psoriasis. Now let’s tell you about Patanjali shampoos that you can use for your hair. Helps to adds shine & strength to your hair. It reduces hair fall and dandruff. It helps in combating the dryness of the hair. This is a mild shampoo and can be used every day. You just need to take roughly 2 ml -5 ml of this shampoo, create a lather and wash it off after 2 minutes. This natural Patanjali shampoo Minimizes breakage. Use this shampoo in small quantity, massage for few minutes and wash if off with normal water. This shampoo lets your hair bounce in style. It adds a shiny glow to your hair due to the presence of natural ingredients like shikakai, haldi, henna and neem. Take around 3 to 5 ml of this shampoo and massage it on your on wet hair for a couple of minutes and then wash it properly. Gives natural nourishment to your hair and scalp. It is also proven to reduce dryness and dullness in your hair. Take a few drops of this shampoo and massage it on your baby’s head. Wash it with pain water. This shampoo is very effective on dandruff and dirt. The shampoo also contains natural conditioner that makes your hair soft and adds a great fragrance too. Take just 2 ml -3 ml of this shampoo and apply it on your wet hair. Just leave the shampoo for on wet hair and massage gently, leave for 1-2 minute and rinse off. For best result use daily. The use of this shampoo makes your hair smooth and silky. It removes the roughness and dryness present in your hair. Take the shampoo in little quantity on your palm and apply it on your head. Make lather and let it remain on your head for 1 minute. Wash it off with plain water. Patanjali products, including Patanjali shampoos are available at cost-effective rates than other shampoos which are available in the market. Patanjali is a name that is synonymous with quality. Their team of quality experts take all the measures to ensure that their products meet the specified quality standards. Patanjali products are Ayurvedic. They follow Good Manufacturing Practises and make use of natural ingredients to manufacture their range. For example, Patanjali shampoos comprise of herbs like Amla, Aleo Vera, Reetha, Shikakai, Tulsi, Neem etc. which are known for their hair care properties. Availability is not an issue with Patanjali products. You can easily find Patanjali stores in every city or can even order your favourite products online and can even get them at discounted prices. So, next time you are out for shopping, do not forget to check out the wide range of Patanjali Shampoos and other products from Patanjali. Opportunities and Challenges For 5G Network In India!